Worst Best Picture: Is In the Heat of the Night Better or Worse Than Crash? In “Worst Best Picture” we search every single Best Picture Oscar winner of all time from 1927 to present to uncover the worst of them all. Conventional wisdom says that 2005’s winner Crash is the worst winner in history. We won’t stop until we’ve tested every last one. Read the the first, our review of Crash, here. Posts will be relatively spoiler free, but there may be some details revealed. Today’s installment is the 1967 winner In the Heat of the Night. Is it better than Crash? Sometimes I look through the list of nominees for a year and I’m blown away. 1967 is just such a year, since The Graduate and Bonnie and Clyde both came out, and lost, to In the Heat of the Night. It’s really pointless to argue what the best movie in that trio is — some would say it’s pointless to compare them all to some dumb movie about racism but those people are wrong we’re gonna do this damnit. There’s a chance you only know a few things about In the Heat of the Night. Maybe you just know Sidney Poitier’s “they call me Mister Tibbs” line. Mister Tibbs himself has to work with an all-white police department in Mississippi to get to the bottom of a particularly complicated murder case. That’s Rod Steiger as the town sherriff who certainly doesn’t think he needs help from a city boy, up there in the photo. There’s a lot more going on than the black-guy-in-the-South drama of man vs. just about damned everybody, but that’s the best part. It’s part mystery and part racial play, and it’s excellent at both. It stays tense — there’s a ton of twists as Poitier and Steiger get closer to figuring out what actually happened — and it does so in more ways than one. Every time I expected a heavy handed treatment of race in a situation I was surprised. Right down to the eventual physical fight where Poitier has to literally run away from racists, it’s difficult, but it’s all the better for it. I’m from the South and I was home this weekend for a visit. I generally tell people that the South is everything they think it is, and that that means whatever you need it to mean, depending on the situation. I can’t say my world was Poitier’s world, but it feels like a real one. It’s important to remember that not all racists are obvious villains and that hate isn’t always as clear as stories make it seem. Crash is offensive because it wants to tell this same lesson, but it does so with a megaphone rather than a reasoned argument. In the Heat of the Night is almost contemplative by comparison. It’s a movie about race and about solving a murder, but it’s about how we interact with “the other,” as well. That part is what will stick with you. The Worst Part: The leads are both excellent, but most of the supporting cast is downright goofy. The town of Sparta, Mississippi is supposed to be ridiculous but it’s probably not supposed to be as silly as I found it. I honestly loved In the Heat of the Night, but c’mon, guys. This is me grasping at straws, but everyone other than Poitier and Steiger is largely interchangeable. Ignore this section. Go watch that slap video again. Pow! Is It Better or Worse than Crash? There is a scene where the two men bond with some good drink and try to get to the bottom of the whole mess. That scene is in every movie, and it usually is so obvious. 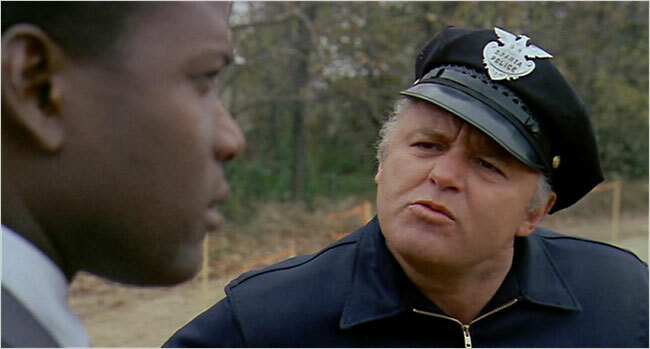 This one adds some important depth to Steiger’s character, who easily could have just been a white cop that says “dagflabbit” and “boy-ah” a lot. He’s more than that, and you notice it play out slowly over the movie, it just finally pops in that big scene. These are the small pieces that make up smart movies. These are the quiet, but significant, chunks of great storytelling. Crash is loud and big and dumb in the exact opposite ways. There is no nuance to Crash, and I can’t think of a better example of “no, do it like this” than In the Heat of the Night, which came out nearly 40 years earlier. Glad you said it, the supporting cast is goofy, downright clownish like Batman villains in the 60’s TV show where it worked because the whole thing was camp. But there’s nothing intentionally camp about the leads and they don’t play it that way. Another problem is the chick, who is it? Lee Remick or something, you can IMDb it, but any guess why? She looks like a Hollywood movie star, not a small town Suthun’ girl. She’s so deliberately beautiful it’s a distraction. And you know what other film sucked from then that everyone loved, a complete G rated comic book posing as a gritty war film? Patton. The whole thing’s a goof. Shooting the German fighter plane with pistols? and that poor mule supposed to make the lead character appear heartless? Shooting a mule in the middle of World War II? I’ll take The Graduate, Bonnie and Clyde (all camp but it works) and a plethora of other treasures not worse than that godawful piece of patronizing, PC trash, Crash.